At Sebago, we gather to set up the schedule early in the year, when the days are still short, dark and cold. TQ and I had volunteered to teach a pair of ACA Level 4 classes, Tidal Currents and Surf Zone, at the Fire Island Inlet on the last weekend in September. It had gotten to feeling sort of fallish in the last week or so of summer - in fact I'd rather unhappily dug out my wetsuit for this year's edition of the Sebago Cup back on September 13th - but this first weekend of Fall, the weather reverted to pure summer. Eighty degrees, blue sky, sparkly water -- and yet still a manageable number of motorboats (I think we were first introduced to Democrat Point by Elizabeth O'Connor of Changing Tides Paddlecraft, she'd mentioned that this wasn't a good location in the summer because of the sheer density of recreational boaters and we paid attention when she said that). Things got a little crazier than usual at work and I was a bit stressed out about the class, but it ended up working out fine. These are fun classes to teach, we had a great bunch of students, and in addition to the weather being just spectacular, the surf ended up being just about perfect for the skill level we had - we had a group of paddlers with a fair amount of experience under their belts, but mostly in more protected water. Gentle little one to two foot waves were good ones to spend some time paddling around in, we saw people visibly going from slightly nervous on their first run into the beach to relaxed and having fun paddling back and forth through the surf zone. Reminded me of how back in small-kid time in Hawaii, I used to call the little waves that you could play in without getting too roughed-up "pony waves" - just big enough to ride without being scary. And for the first day, the eddy around Sore Thumb wasn't quite working when we got there and I was having visions of having to give people refunds because the eddy was broken - but that's a nice spot for a lunch break and as we ate I watched my eddyline form and sharpen up nicely. Between that and the sent of standing waves that form at Democrat Point as the ebb flows across the sandbar that forms there, it's an excellent place to introduce people to moving water. I didn't take my camera on the first day because I was in charge that day; the second day I did take it and did get some nice pictures of the day. And that's all she wrote today, so click on the first picture for a slideshow view! Haven't quite got time for a proper trip review, but here's a big big to thank you to Peter at the Norwalk Yacht Club for once again inviting Sebago up for another fine day of paddling around the Norwalk Islands. Always nice to get back up there, and the weather (and the post-paddle barbecue) just couldn't have been much nicer. Click here for more pictures. Due to some poor judgement on my part way back when we set up the Sebago calendar in the Spring, I am finding myself in a bit of a time squeeze here in the 2nd half of September. Been wanting to come back and do a wrap-up post on my Hudson River trip, plus last weekend was interesting, but I just haven't got much time for the blog. However, I did want to share some information that was sent to me a couple of weeks ago by "Ol' Philosophizer" who used to maintain a very entertaining blog (sadly gone now although they still have some good trip reports) for the Malden Yacht Club kayaking club in Malden, NY. I actually would have loved to meet Ol' P and his Malden friends during my trip down the Hudson, they seem like a fun crew, but I have a LOT of friends along the Hudson and after sending out "hey I'm doing the Watertrail, let's get together" emails to a half-dozen different people it finally sank in that every get-together was going to require logistical planning and I should probably stop where I was (worked out to a nice balance of solo time and social time). However, Ol' P did see that I'd been through his bit of the Hudson (Day 2, Malden is just north of Saugerties), and that reminded him to send me a note he'd sent out on TopKayaker.net about a recently enacted NY State law concerning launching and landing practices for all watercraft. I hadn't heard about this and I wanted to pass it on. "This may be of interest to anyone who currently kayaks in "public waterbodies" in New York, or plans to do so in the future. (A) "WATERCRAFT" SHALL MEAN EVERY MOTORIZED OR NON-MOTORIZED BOAT OR VEHICLE CAPABLE OF BEING USED OR OPERATED AS A MEANS OF TRANSPORTATION OR RECREATION IN OR ON WATER. (B) "LAUNCH" SHALL MEAN TO PLACE A WATERCRAFT OR FLOATING DOCK INTO A PUBLIC WATERBODY OR ANY INLET OR OUTLET TO SUCH WATERBODY FOR ANY PURPOSE, INCLUDING BY TRAILER OR OTHER DEVICE OR CARRYING BY HAND A WATERCRAFT INTO THE WATERBODY. The law will require (it's effective date is delayed for one year) that all boaters take "REASONABLE PRECAUTIONS SUCH AS REMOVAL OF ANY VISIBLE PLANT OR ANIMAL MATTER, WASHING, DRAINING OR DRYING AS DEFINED BY THE DEPARTMENT PURSUANT TO RULES AND REGULATIONS," the department referred to being the Department of Environmental Conservation. Although I have no argument with the policy in question, I am a bit concerned about the eventual procedures. Crafting regulations that apply equally to operators of motorized vessels as well as to those who canoe and kayak will be difficult. Hopefully, a set of recommended practices will be forthcoming within the next year. Until then, recreational boaters in NY should be alert for further information on this topic. Failure to comply could result in a civil penalty as high as $1,000 (on the fourth, or more, offense)." 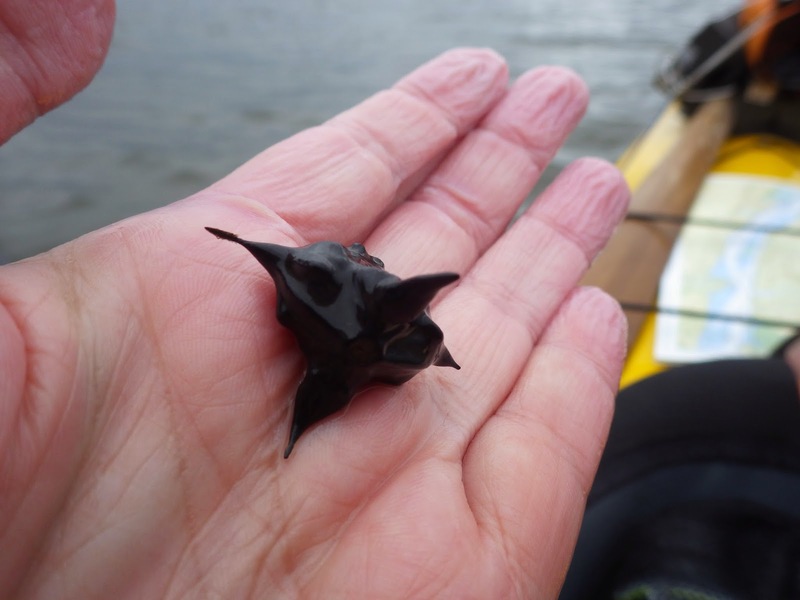 And here are a few pix of that horrible water chestnut that chokes the quieter freshwater reaches of the Hudson, taken at one point on my August paddle when I was just blown away at the sheer acreage that has been swallowed by this plant. You can't paddle through this properly, it's too dense. No walking barefoot near the river up there, the seedpods have stout spines that are arranged in such a way that one's always pointing up. Susan Fox Rogers, author of the wonderful book My Reach, was one of the people I did manage to meet up with during my trip; she mentioned that one way she likes to teach kids about the dangers of invasive species is by taking them out in the Tivoli Bays and having them spend some time pulling this stuff. Makes sense - you could pull for hours and not make a visible dent (and if you did, the dent would be gone when you come back next week). This is just one of the invasive species whose spread the new law is intended to fight. Read more about the dreadful stuff here. Photo swiped from Dr. Walters' Safe Passage blog - love it! Just taking a quick blog-break from work as I just realized (duh) that Dr. Walters' first event here on her NYC visit is TONIGHT, Thursday, September 18th, at the REI store in SoHo, with another tomorrow at the EMS (Eastern Mountain Supply) store in SoHo and then a 3rd at 10 a.m. Sunday morning at Sebago Canoe Club in Canarsie (yes, my Sebago, woohoo!). All 3 are open to the public. Full event details here, and that link is to a calendar that shows her planned schedule all the way through to Summer 2015, so if you're stumbling across this down the road because you heard she was coming to your area and wanted to see if she was speaking (or even better, if you want to arrange for her to speak), head on over there, the info you want may be there. Dr. Walters is boating from Maine to Guatemala, mostly kayaking although for safety's sake she will be riding on a sailboat through a stretch off of the Mexican coastline where attacks on small craft are unfortunately a major risk, as a fundraiser for Safe Passage (Camino Seguro), an organization in Guatemala that works to benefit at-risk children and their families. The organization was founded by one woman, Hanley Denning, who had gone to Guatemala to learn Spanish in 1996 and instead found her life's calling there when a Guatemalan friend asked her to go on a visit to the slums near Guatemala City's garbage dump. Her efforts began with setting up a small school for children whose parents could not even afford to send them to public school, and then grew to include an early childhood center and literacy programs for adults. Sadly, Ms. Denning was killed in a car crash in 2007, but her efforts live on. To talk about the success of the Safe Passage model school that fosters critical thinking, self sufficiency and confidence. A lot of the publicity focuses on her being a grandmother, which is cool, I bet her grandkids are all incredibly proud of their grandma - I'm also very impressed by the fact that she's a retired scientist; her bio doesn't say exactly when she earned her doctorate but it looks like it had to be late 60's or early, early 70's, when I think that a woman who'd chosen science as a profession was probably still running into masses of roadblocks set up by people who didn't want her there. She's also got one HECK of a paddling c.v. - makes my recent Waterford to NYC solo trip look pretty darned tame (well, it was pretty darned tame, that was kind of the whole point since this was my first ever solo multi-day camping trip, but still, we're talking, like, basket of week-old kittens tame here). To learn more about her expedition, click here, or visit her blog (link in the photo caption). Ordinarily, if September 11th falls on a work day, my personal ritual is to walk downtown and around the site. This year I decided to let that go - I'd gotten post-work paddles back into my schedule as I was preparing for my Hudson River trip, and I enjoyed it, and I want to keep that up as long as weather permits. Weather definitely permitted tonight, I was even able to use my recently repaired surfski, there was a spectacular moonrise (not quite full, it's beginning to wane, but still doing a fine Great Pumpkin impersonation as it rose from the clouds), and it was moving seeing the Tribute in Light from out there. Pictures are a little fuzzy, hard to hold steady on a surfski, but give the general idea. Beautiful, beautiful night out there. Click for a slideshow view. Photo I took from the Circle Line "half-circle" cruise a long time ago - this was either when we came to my cousin David's wedding (he and Jeannie met when they were both attending med school here in the city and that's actually how I ended up here, I was living with my folks in England but turned out to be entirely too law-abiding to go out and find myself an under-the-table job as friends had suggested I could do - a good friend who'd moved to the city and was loving it suggested I go on an interview while I was here, and although the first job was a bit of a disaster, it at least got me here) or when my parents came to visit me after I'd moved here. Have to get a better scan sometime but I'm so glad I do have this picture - love the way the towers and the Brooklyn Bridge echo each other. Over on Facebook, I have been doing the "five days of gratitude" thing, I'd been challenged on Friday and although I initially told Luseana that I was going to start on Monday, I realized later that if I started on Friday, that would put Day 5 on the day that will probably always be the one day of the year when I feel the most grateful, both for surviving and for being able to actually be of some small use to others for the rest of the day after John Krevey got a ferry service going with one of the tour boat companies that would sometimes use Pier 63 as a departure point for parties. I had worked at the World Trade Center, I'd been laid off that June with a generous severance package, I was a partner at Manhattan Kayak Company, the economy at that point was strong enough that I was confident of getting another desk job when I needed to, so I'd spent the summer being a kayak guide on a technology officer's salary (sweet deal, yes) - I was back at the WTC that day because both the severance package and the guiding work were going to run out in October and it was time to start looking again and part of my severance package was an outplacement workshop - I just happened to pick the one on September 11th, but I was still on the ground when the first plane hit and managed to escape on what had to have been the last train out, moments after the second plane hit. I was in exactly the wrong place that morning, but I was very fortunate in all other respects and I will always be grateful for that. Here was the story of the day as I'd written it for my family, that night. In the past, I've usually gone down for a walk around the area, but I've brought my paddling gear today and I think that this time, I'm going to go do my reflecting out on Jamaica Bay. As usual, click on any picture for a better view. Sunday, August 18th - My friends at Yonkers had offered to find me a place to stay for the night, but I'd said if it was OK, I'd rather stay at the clubhouse. This worked out wonderfully - I slept very well on the bench in the meeting room and I must have been excited all the way down to a subconcious level about the last day because for the first time in the entire trip, I could have skipped the alarm clock - it was set for 5 am as usual, and I woke up feeling completely rested, refreshed and eager to go at 4:50 am! I dressed, had an energy bar for breakfast, collected the day hatch stuff and the other items I'd spread out to dry, re-packed my boat, re-filled my on-deck water bottles, and as a final step stashed my cell phone in a small drybag in the day hatch, where I could reach it easily, in case I needed to text TQ with any updates about what time he should meet me. I'd told him probably around 2 at Pier 40, assuming I would have the same slow start I'd had every other morning - I didn't send him an update from Yonkers even though I was finally getting on the water at the perfect time because I wanted a good cushion to play with in case of...oh, in case of whatever. I was on the water right around 6. The sunrise was lovely and a little bit later, there was a piece of a rainbow over the Palisades. The ebb had just been getting started as I got on the water and as I approached the northern tip of Manhattan, it was increasing. I swept under the George Washington Bridge so fast I barely got a shot of the Little Red Lighthouse (that being the seventh of the lighthouses I passed on my trip - the only one I didn't get a picture of was the Stony Point Lighthouse, which is up in the middle of Stony Point State Park, which I passed on my longest day on the river - even if I'd known exactly where it was I don't think I would've been inclined to make a stop to see it). "If you want the rainbow, you must have the rain" - yes, the rainbow over the Palisades did of course mean rain was headed my way, and that started right around the George Washington Bridge. I thought about pulling out the short-sleeved paddling jacket I'd had in the dayhatch for the entire trip, but decided that if I just kept paddling at a good clip that would keep me warm enough. When I found myself approaching the water treatment facility at 125th St. before 8:30 am, I decided it was time to send TQ an updated ETA. There is a small dock at the Fairway market at 125th Street, and I pulled over there to get out the cell phone. I texted TQ that I was now expecting to be there closer to noon, then put the phone away and pushed back out into the current. As I approached the north end of the mooring field at the 79th Street Boat Basin, I saw flashing paddles approaching along the seawall - turned out to be some of the women of New York Outrigger out for a morning training paddle - I shouted hello as they went by and told 'em where I was coming from and their steerswoman, Di, who (along with a lot of other NYO folks) is an old friend from my Pier 63 days, flashed me a thumbs up. New York Outrigger - IMUA! I'd already been in a good mood whirling along this oh-so-familiar stretch of the North River (as the stretch of the Hudson that runs by Manhattan is known) and seeing the NYO gang made it even better. A second outrigger passed heading north a little bit later and then a little bit later still I heard "Hut-HO!" from behind me and glanced back to find the first boat out in the current and bearing down on me fast - of course I immediately went into a sprint and raced them until they swept inexorably by and I capitulated, calling out "You guys are too good, I can't keep up"! I thought to try to draft a little too late, put on a last burst but couldn't catch 'em, gave up watched them charge away, but that had put me in just a fantastic mood and although I went back to cruising speed I kept some of that energy as I passed by all the familiar landmarks from my Pier 63 days. 79th St. Boat Basin, "garbage barge pier", the "Uptown Downtown Boathouse" (although I think there's a new occupant there since the Downtown Boathouse was able to move back to the new boathouse on their original downtown pier this year), the Intrepid, Circle Line, the barge at pier 66 where I kept my boats for my first few years of paddling, Chelsea Piers where I actually learned to paddle a kayak and also the home of Classic Harbor Lines, the tour boat company I worked for on a part-time basis for five very enjoyable years, the fireboat station at the Gansevoort Peninsula, and then all of the sudden there I was pulling into the embayment to the south of Pier 40 at...10:30 am??? Hmm. Intrepid and submarine Growler - navy brat, had to say hi! The barge at Pier 66, formerly at Pier 63, which is where I kept my boats until 2006. 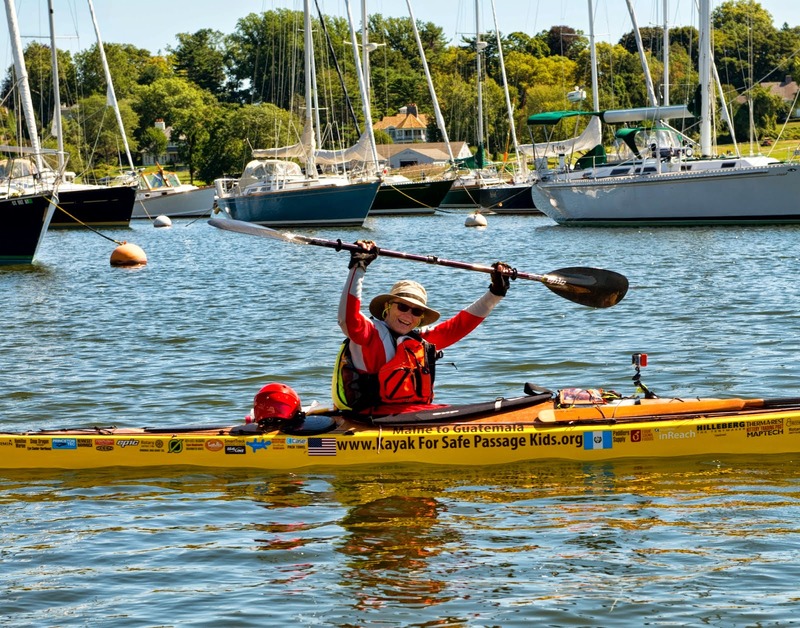 Thanks to John Krevey for giving us such a welcoming home at a time when paddling was still regarded somewhat nervously by the powers that be. We all miss you, John. Classic Harbor Line fleet - I worked on the Manhattan (motor yacht) and the Adirondack (white-hulled schooner); the America 2.0 joined the fleet after I'd left to go sail Sunfish at Sebago. Lovely boats, and a good outfit to work for. The Chelsea Piers embayment where I took my first kayak lesson from Manhattan Kayak Company in 1998. I wonder if I would've believed you if you told me how far (literally) I was going to take this kayaking thing! I had picked Pier 40 as a takeout for a couple of reasons. New York Kayak is based there and if I'd somehow turned into a total beast (in a good way) on my paddle and gotten back in 6 days, on Saturday, or if there'd been some big problem at TQ's pool on Sunday and he'd needed to go help take care of it, there would have been a safe place to keep my boat overnight, and I could have gone home on the subway. It's eminently achievable from Yonkers, conditions would've had to be really, really bad to keep me from getting there, and another practical consideration was that I wasn't really thrilled with the idea of crossing the area between the Battery and Governor's Island by myself. That spot is basically a 5-way intersection for some very big, very fast traffic; I don't mind crossing in a group because a group is a little more visible and with more eyes you have a much better chance of spotting anything you'd need to avoid. But it was only 10:30, the ebb was still going strong, the traffic hadn't looked too heavy so far, I was feeling great, and the idea of finishing in my home borough of Brooklyn, at Valentino Park, which has been the launching and landing site for a lot of good adventures, was incredibly appealing. I only got out of my boat to go tell Randy that I was OK and heading on south - I'd told him I expected to arrive on Sunday and I didn't want him to worry; turned out he wasn't even there but I left word I was fine with Carey, went back to my boat, pulled out the phone again and texted TQ, "I'm going to Red Hook!" - and the way things were going, my ETA was still noon! Ebb carried me on south beautifully; just as I approached the Battery, the Staten Island Ferry and a Statue of Liberty ferry pulled out, and the SeaStreak cruised by - that was actually perfect, that meant a number of the boats I'd been concerned about were just leaving the area; I did a good look around for tug-and-barge units and other big guys who I would need to avoid, didn't see any of those, so off I went. A couple of tour boats did pass as I scampered across to the red buoy just north of Governor's Island, but not close enough to cause me any worry. I crossed the Buttermilk Channel and stopped at the Mary A. Whalen to see if Carolina was by any chance out; didn't see her but shouted out "Ahoy the tanker!" and that brought her on deck to see who was yelling out there. Great fun sharing what I'd just done with her, she took that lovely picture of me about to finish, of course, and it turned out that with TQ coming to get me in a station wagon, we were going to be able help her move a little of the remaining heavy metal from her Heavy Metal fundraising sale, so that all worked out nicely and I was really glad I'd stopped by. Carolina's shot, me in the homestretch, very happy! With a few more minutes to spare, I set out again - by now the flood seemed to be started in the Buttermilk Channel, but I didn't have far to go and by 12:10 I was pulling into the cove at Valentino Pier, where TQ was waiting for me. Hooray! We unpacked my boat, loaded up the car, and went and helped Carolina move her metal (which was indeed heavy, but we got the things she wanted shifted shifted in two trips). She gave me a shackle the size of my two fists together as a thank-you present, which I have sitting on the windowsill in the living room now, and offered to take us out for lunch. Now, ordinarily I would jump at lunch in Red Hook, there are some great restaurants there, but the weird thing was I wasn't particularly hungry, and the not-so-weird thing was that I could feel the mother of all nap attacks coming on, so we said thanks but no thanks. Took my boat to the club, offloaded that, then TQ helped me bring all of my gear up to my place. We agreed to meet for a sushi dinner later (we love sushi and I wanted to take him out as a thank-you, he'd taken a day off from work to come meet me) and after he took off, I sort of dealt with the gear, turning every bag upside down, dumping the contents on the floor, hanging a few things (the tent and the soggier paddling clothing) up in the bathroom, spreading the rest out so that at least nothing would fester. Then there was a sandwich, a shower, and a long and wonderful nap in my own bed. Good to be home! 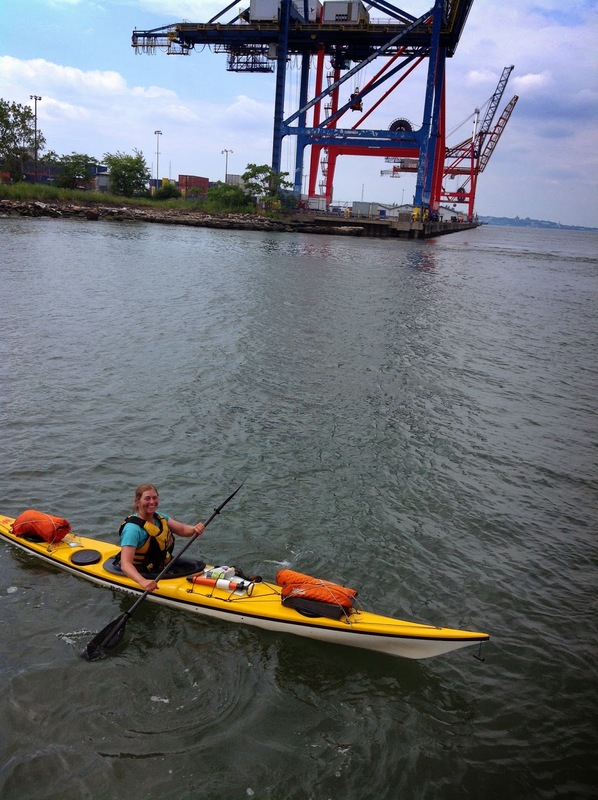 Google map, Day 7 - Yonkers to Red Hook, 20 miles.